A range of nonprofit experience. A clean and philanthropic reputation. A warm and engaging personality. But before you declare your executive search efforts futile, keep in mind that all it may take to draw potential candidates out of the woodwork is for your nonprofit to sell your cause and community impact in just the right light. 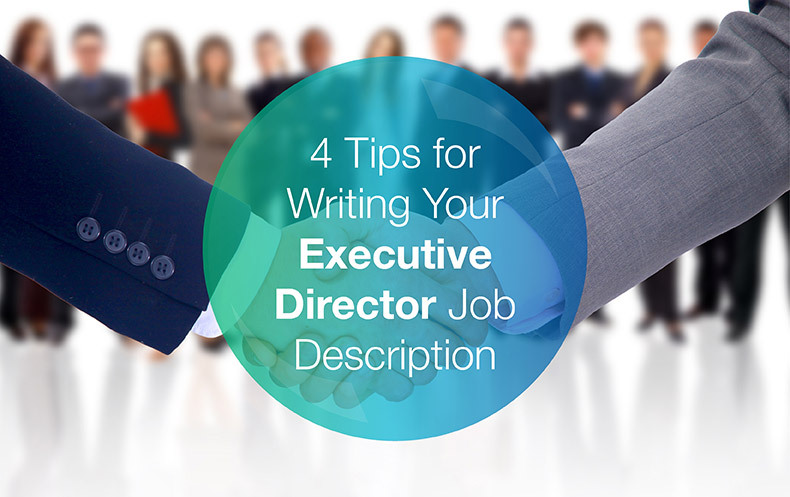 Utilize an executive director job description template. Host executive director job information on multiple platforms. Emphasize your nonprofit’s culture in your executive search. Develop an executive director recruitment strategy. Once you’ve taken these necessary measures, your nonprofit’s next executive director should step forward in no time! Let’s dive in with our foolproof executive director job description template below! More often than not, the detail and tone of your executive director job description will be your applicants’ first impression of your nonprofit. That’s why it’s imperative for your nonprofit to compose a job description that holds equal parts personality and professionalism. You’re receiving this letter because we over here at [Insert nonprofit’s name here] believe in recognizing people for their nonprofit achievements — and congratulations, we’re impressed! The position of executive director has recently opened up at our organization and we’re looking for someone like you who can provide unlimited drive and dedication to serving our cause and community. This instrumental role is ideal for an outgoing, renaissance man (or woman) who enjoys leading humanitarian conversations and being personally involved in all aspects of a growing nonprofit. If you’re interested in pursuing this life-changing opportunity, simply fill out and mail in the application portion of this letter or visit our website to complete an online application. On behalf of everyone at [Insert nonprofit’s name here] thank you for all of your hard work in the nonprofit arena and we look forward to hearing from you soon! This executive director job description template does an excellent job of engaging the candidate in a personalized fashion by acknowledging their existing nonprofit accomplishments and how their background will fit in with the nonprofit’s needs. Bonus! If your organization wants more help with crafting your job description, why not consider hiring a executive search firm? These top-notch firms can do more than just draft your job description; they’ll help guide you through the entire hiring process so you can find the most qualified candidate. Takeaway: When organizations use a template when writing their job descriptions, they can make sure that they’re including all the necessary elements to make the most accurate description possible. Besides constructing a well thought-out job description, there are several other maneuvers your nonprofit can utilize to better get the word out on your executive director vacancy. For instance, hosting your executive director job description on multiple platforms will help you reach a more diverse pool of contenders — and we’re not just talking about LinkedIn. By the end of the day, your email will be overflowing with eligible applications. Takeaway: Hosting your job description in a variety of different places will ensure that you reach the most potential candidates so that you can find the person that best fits the role. Remember that your executive director isn’t just signing on for a new job, but rather joining a whole new team! That’s why while writing your executive director job description, your nonprofit should take extra care in emphasizing your company culture to give your applicants a good idea of what makes your nonprofit stand out. Oftentimes, your nonprofit culture and team could be the deciding factor on whether or not your top executive director candidate takes the job. Takeaway: Finding someone with the necessary skills is one step, but it’s also important for that person to get along with your nonprofit’s team and to fit in with culture of your organization. Now that you’ve thought about how to attract applicants with a killer executive director job description, it’s time to assemble an evaluation process to determine which one is the best fit for your nonprofit. After all, executive director is a huge undertaking and you’ll want to ensure that the person you select is up for the responsibility. To help you find the right candidate faster and more efficiently, your nonprofit must organize a lengthier selection process with three essential components. Before you start the hiring process, it’s important to create a succession plan that outlines how the new person will transition into their new role. Ideally, the succession plan should be created well in advance before you need a new position so that you’re prepared for an unexpected departure or leadership change. However, if you don’t already have a transition plan, now is the time to create one before you begin your new role. An overview of the responsibilities and day-to-day tasks of the executive director. Any challenges or opportunities the previous person faced. A list of potential candidates (internally and externally) that could take over the role. Steps that will help transition the person into their leadership position. Once you have all these elements organized, you’ll be better prepared to start the hiring process and onboard your new executive director. Nowadays, the typical job interview process may comprise two to four phone-based and in-person interviews before an offer is even extended. With that in mind, how extensive should your nonprofit’s executive search process be? The answer is grounded in just how pivotal the executive director role is in determining your nonprofit’s future goals and success. Therefore, it only makes sense to hold your executive director applicants to a higher standard of rigorous screenings and interviews than other leading nonprofit officers. Create a search committee that includes HR representatives, fundraising specialists, planned giving directors and more, as long as each member can bring something new to the team in terms of skills, personality, or experience. This committee will conduct rounds of interviews, your search committee can also share their input for what the executive director job description should entail as well as recommendations for qualified contenders. Applications without a cover letter or references. Typos or misspellings in resumes or cover letters. Inauthentic or faux cover letters. Resumes detailing less experience than required. Applications that did not follow your specified process. Your nonprofit already has enough on it’s hands without having to waste time on job candidates who did not follow your guidelines or simply don’t fit the role. Rest assured, any nonprofit with concerns about writing an executive director job description can always reach out for a professional helping hand by uniting with a notable executive search firm. Executive search firms are invaluable to nonprofits in how they analyze your specific needs and recruit and train exceptional leaders to meet them faster. By taking advantage of these headhunting and onboarding services, your nonprofit’s executive search process will reap the most rewards and run as smoothly as possible. Takeaway: Having a plan for how you’re going to hire and onboard your new executive director is essential because it helps keep everyone on the same page and sets up your new hire for success. Altogether, our executive director job description template and recruiting best practices are guaranteed to open up a realm of possibilities for your nonprofit’s next executive leader. Major Gift Officer Job Description [Free Template] — Develop the relationship between your nonprofit’s executive director and major gift officer with DonorSearch’s MGO hiring tips! Top 10 Fundraising Consulting Firms for Better Fundraising — Help your new executive director grow your fundraising needs by reviewing DonorSearch’s top 10 fundraising consulting firms! Nonprofit Staffing: 5 Tips for Developing Executive Roles — Check out @Pay’s expert tips for creating and hiring new nonprofit executive positions!